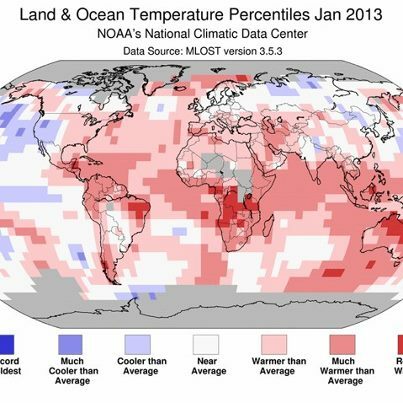 January 2013 was the globe’s 9th warmest January since records began in 1880, said National Oceanic and Atmospheric Administration’s National Climatic Data Center (NCDC). Ice-Free Arctic Ocean in 2030? Vast uncertainty remains over the causes of melting Arctic sea ice and when it may disappear altogether during the summer, which would have consequences for oil explorers, shipping firms and the fight against climate change. The answer will depend on the balance of natural and manmade causes. Last September sea ice reached its lowest level in the satellite record, which dates back to 1979, a development that has implications for local native communities and wildlife, local coastal erosion and possibly northern hemisphere weather. Under the albedo effect, dry snow reflects more than 80 percent of solar radiation; bare ice 65 percent; and open water just 5 percent. And increasing expanse of open water each summer warms up faster than ice-covered sea, meaning new ice will be thinner and more vulnerable the following year. There are various underlying causes of the melt. Rising greenhouse gas emissions drive up air and sea temperatures. Water from a warmer Atlantic entering the Arctic Ocean through the Fram Strait between eastern Greenland and Svalbard, an island due north of Norway. A similar inflow of warmer Pacific water through the Bering Strait has long been identified as an important process that causes the thinning of ice in the central Arctic. There are also weather effects that may be natural, partly natural or entirely due to greenhouse gas emissions affecting Arctic ice. A particular weather pattern contributed to a big melt six years ago by sending warm air towards the central Arctic, according to researchers from the Netherlands, Sweden and Germany. The cumulative impact from rising greenhouse gas emissions, which combined with a few freak summers, ice export and the albedo effect could finish off summer sea ice rather quickly. Increasingly, scientists and researchers are coming to believe that a seasonally ice-free Arctic Ocean might be realized as early as 2030. There are 13 million square kilometres of permafrost in Alaska, Canada, Siberia and parts of Europe. 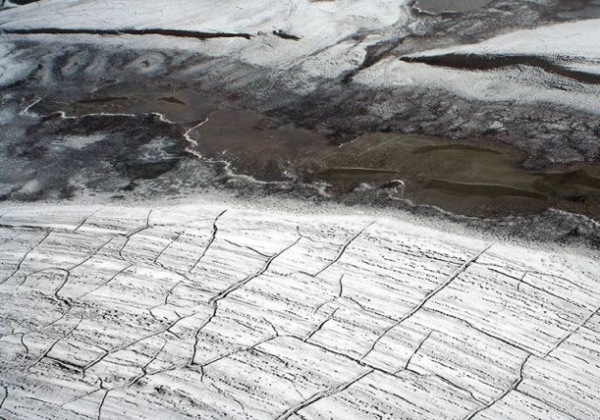 A 2011 study estimated that global warming could release enough permafrost carbon to raise global temperatures three degrees C on top of what will result from human emissions from oil, gas and coal. 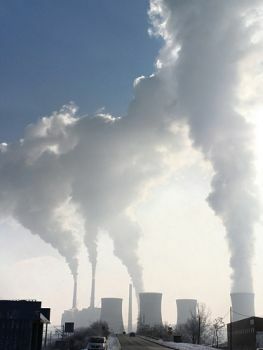 Human emissions are headed for four degrees C of global heating, warned the International Energy Agency (IEA) this week. A rapid “decarbonization of electricity supply” is needed to avoid that future. For the first time, the U.S. Environmental Protection Agency (EPA) has publicly released a draft plan on how the department’s programmes will adapt to global warming, in a move that could lay additional groundwork for important new emissions rulemaking the agency may announce in coming months. The EPA is tasked with oversight of the health of both human communities and natural systems, mandated with creating and implementing standards relating to air and water quality, among others. As such, the agency has emerged at the frontlines of Washington’s attempts to push through stricter climate-related regulations while circumventing the U.S. Congress, which remains fractious and politicised over the reality of human responsibility for global warming. The week’s hottest temperature was 115.3 degrees Fahrenheit (46.3 degrees Celsius) at Mardie, Western Australia. The week’s coldest temperature was minus 68.3 degrees Fahrenheit (minus 55.8 degrees Celsius) at Russia’s Siberian outpost of Oiymakon. Carbon dioxide emissions in the U.S. fell to their lowest levels since 1994 last year, with greenhouse gas emissions from the country’s power plants seeing a 4.6 percent drop for 2012 alone. Overall CO2 emissions fell by 13 percent over the past five years as new energy-saving technologies were adopted, including a switch from coal to wind, solar and cleaner-burning natural gas. Geothermal and hydroelectric sources also helped reduce air pollution. But America got 31 percent of its energy from natural gas, which came about due to an explosive use of fracking. 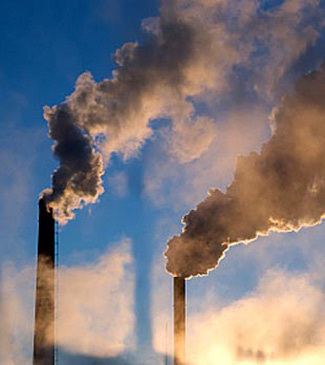 America’s improvement in greenhouse gas emissions is offset by the burst in air pollution being generated in developing countries such as China. At least 300 people, including many school children, have been injured when two passenger trains collided near the South African capital, Pretoria. Medical workers say 28 people were seriously hurt. The theft of copper cables used for signalling, compounded by human error, caused the crash, said the head of South Africa’s rail authority. The early morning accident happened when a train crashed into a stationary train near Attridgeville, a township west of Pretoria. A passenger plane crashed in thick fog near Kazakhstan’s commercial capital Almaty on Tuesday and broke into pieces when it hit the ground, killing all 21 people on board. (13s) was located approximately 460 nm north of La Reunion. Felleng is predicted to continue to intensify as it nears Madagascar. Felleng will travel between eastern Madagascar and La Reunion Island by Feb. 1. At least seven people have been killed in a landslide in Turkey. The landslide also hit a football pitch in Sirnak, Turkey. Flooding has been reported in Devon, Somerset and south-east Wales. Heavy rain and strong wind warnings have been issued in these regions. Heavy rainfall has caused flooding in the Spanish Arch, Galway city of Ireland. The gale force winds, high tides and heavy rain caused flash flooding in Galway city. Galway city is currently on high alert. Floods also closed Wolfe Tone Bridge and Lough Atalia Road. Massive summer floods have killed four people and forced thousands of people to evacuate their homes across two Australian states on Tuesday, disrupting air and rail travel and coal production. A deluge fed by the ex-tropical cyclone Oswald dumped more than 200 millimetres (8 inches) of rain in some areas of the Queensland and New South Wales states over the past three days, swelling rivers and swamping towns. The worst-hit areas were around Bundaberg, Rockhampton and Ipswich in the Queensland state, and around the northern New South Wales towns of Grafton and Lismore. A fleet of 14 helicopters rescued more than 1,000 people across Queensland overnight and rescue efforts continued on Tuesday. Natural disaster areas have been declared in ten local government areas hit by flooding in northern NSW. Several parts of South Africa are currently experiencing an intense heatwave. Temperatures were between 35 to 40 degrees in the Free State, the Northern Cape, North West, Limpopo, Mpumalanga and Gauteng. The week’s hottest temperature was 115.7 degrees Fahrenheit (46.5 degrees Celsius) at Penrith, NWS, Australia, (western suburb of Sydney,) which broke its all-time record high with 114.4 F (45.8 C) the same day. The week’s coldest temperature was minus 66.1 degrees Fahrenheit (minus 54.5 degrees Celsius) at Russia’s Siberian outpost of Oimyakon. Wheat futures rose for the second time in three sessions on renewed concern that the worst U.S. drought since the 1930s is eroding prospects for crops in the southern Great Plains. Little or no rain has fallen in parts of south-central Kansas and north-central Oklahoma in the past three months, according to the National Weather Service. As much as 25 percent of the wheat crop may go unharvested this year, when farmers begin collecting grain in June. Two trains packed with morning commuters crashed head-on Monday on Vienna’s outskirts after a state railway employee apparently forgot to activate a signal. Railway officials said 41 people were injured, five seriously. A statement from OBB, Austria’s state railway, said initial investigations show that a supervisor neglected to trip a signal after manually activating a rail switch. The U.S. Plains remain in the grip of a severe drought, according to a report issued by a consortium of federal and state climatology experts, raising fears that another hot, dry year could lie ahead for crop-growing and cattle-grazing regions. Fifteen crew members of the ship KM Tirta Samudra XXI, which sank in the Java Sea early Friday, have been drifting on a lifeboat near Karimun Jawa Island, have remained unreachable due to extreme weather and 4 metre high waves. Latest rescue attempts failed to find the lifeboat at the co-ordinates given. A huge sunspot known as AR1654 produced an M1-class solar flare, which is heading towards the Earth. The sun is in an active phase of its current 11-year weather cycle, which scientists call Solar Cycle 24. The sun’s activity cycle is expected to reach its peak (or “solar maximum”) in 2013.